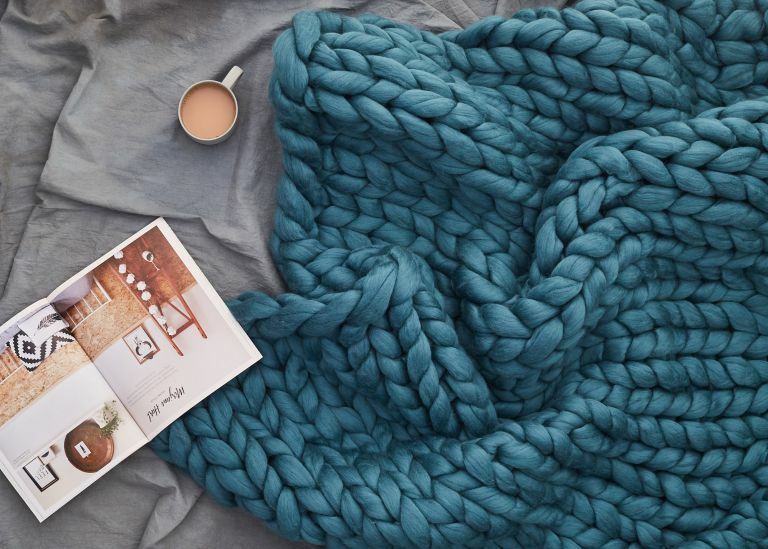 Chunky knit blankets are everywhere right now, you don't have to scroll very far through Instagram to see one draped on the end of a bed or thrown over a sofa. Yep, we love them. But what we don't love is thought of having to remortgage our houses to be able to afford one. If you are after more crafty projects we have plenty of ideas over on our hub page. Lay your yarn across the palm of your hand and hold it with two fingers. Leave 4in hanging below your little finger. Wrap the yarn around your hand. Turn your hand so that your palm is facing down. With your other hand, slip your fingers under the first loop and grab the second loop that attached to the ball of yarn. Bring the yarn through the loop. Make a loop with the yarn attached to the ball so that the yarn hangs in front of your hand. Put your left hand through the loop that sits below your little finger. Grab the working yarn and pull it through the loop. Drop the original loop off your right-hand fingers and place the new loop on your wrist. Pick up the yarn attached to the ball and place it over your thumb and hold between your fist. Pull the first stitch from your right-hand wrist over your fist. Turn the new loop slightly clockwise so the yarn attached to the ball is closest to you. Place the new stitch on your left wrist and pull gently on the yarn attached to the ball to tighten the loop on your wrist. When you have finished casting on your desired amount of stitches, you will use the same technique to do all of your other rows. For each cast on stitch allow 2.2in. For example, if you want a blanket that is 22in wide, then cast on 10 stitches. Pick up the first stitch that you knitted and pull it up and over the second stitch. Drop the stitch off completely over your fingers so that you have one stitch remaining. Repeat until you have one stitch left. Pull the end of your yarn through the loop and pull to tighten. To neatly hide the strands of yarn left, weave them in and out of each stitch until they are secure.